Soft foam shield. Light Gray with Army Olive Green inset color. Approximately 10-inches (25cm) diameter x 1-inch Deep. 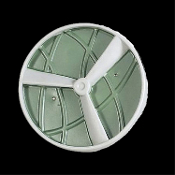 Hollow back flexible rubbery plastic light-duty foam shield, includes attached rubber shield holding grip on back. Can also be used for any steampunk cosplay costume, as an interesting accessory or decorative addition for prop building displays! *Please note that this lightweight foam shield is NOT suitable for children under 3.